Welcome to my web-site. My name is Malcolm Platt-Grigg & this site represents the accumulation of almost twenty years of research. It covers both lines of my parents & also includes various branches that have married into my direct lines. GRIGG: Traced back to the West Midlands of England, from the original counties of Worcestershire, Shropshire (Salop) & Staffordshire. The earliest records I have found for my direct line of Grigg's dates back to the early 1700's from the Halesowen area (originally in Shropshire but later in Worcestershire). The family spread out to Dudley, Northfield, Harborne & Edgbaston. PLATT: The family established themselves in Wednesbury, Staffordshire for many generations dating back to the late 1700's. According to census entries, it seems that they moved from Shropshire around 1790. Samuel Platt (born c.1780) started a foundry at King's Hill, Wednesbury which grew in to a large business, employing over 50 people & operating until the 1970's, later named Samuel Platt Ltd.
DAWSON: This is my mother's line, from the Rutland & Lincolnshire counties. I have traced this line back to the 1800's to Long Liddington & Essendine, Rutland. They later moved to Oakham & eventually to Stamford, Lincolnshire. LOVE: My mother's mother's line, traced back to Little Hallingbury, Essex, moved to Enfield & later to West Ham, Essex & London. Research dates back to the mid 1700's. HICKMAN: The Hickman's were established in Wymondham, Leicestershire from the early 1800's. It seems they originally came from Somersby, Leicestershire in the late 1700's. BURSNALL. HINTON, MORRISON: Married in to my HICKMAN line, also from Wymondham, Leicestershire, dating back to the late 1600's. THOMAS: From the Kingswinford / Wordsley area. My great-grandmother's family. HARTLAND, HORTON, HOWL: Married in to my PLATT line, mainly from the Wednesbury, Walsall area. HUGHES, TRANTER, GISBORNE: Married in to my GRIGG line, from the West Midlands area. PINNUCK, SHEEN: Linked to my LOVE line. Pinnuck research dates back to the mid 1500's. I'm also compiling family trees of the other lines of Grigg families from the area, namely West Bromwich, Smethwick, Harborne, Oldbury & Halesowen. See links below to view these trees. These trees are in their infancy & still need a lot of work to confirm their accuracy. Although there is no direct connection to my Grigg line as yet, I'm sure these Grigg families are all related, I just need to confirm it. ** Images now added to my family tree including census images, church records, family photo's, etc. ** I now have a new email address, see link at bottom of page. ** New additions to my family tree, including recent research on Love, Grigg & Platt families. ** Sources (Census entries, Church records, etc) now added to many family members. ** New page for Gisborne Musical Instrument Makers, Birmingham, established by James Gisborne. ** New page on the Grigg Motorcycle Company, Twickenham. ** 2 new trees added. Uriah Platt & Francis Platt, both of whom I suspect are related to my Samuel Platt. LINK TO MY FAMILY TREE ANCESTOR CHART AT WORLDCONNECT (updated 30 Jan 2015). Displayed in traditional family tree fan chart for easy navigation. ** URIAH PLATT APPEARS TO HAVE BEEN BORN c.1781 IN DARLASTON, sTAFFORDSHIRE. ** FRANCIS PLATT WAS BORN c.1772 IN MARKET DRAYTON, SHROPSHIRE. BOTH SEEM TO HAVE STRONG CONNECTIONS TO MY SAMUEL PLATT BORN C.1780 IN MARKET DRAYTON, SHROPSHIRE & LATER MOVED TO DARLASTON, STAFFORDSHIRE. I WOULD LOVE TO HEAR FROM ANYONE RESEARCHING EITHER OF THESE 2 FAMILIES. 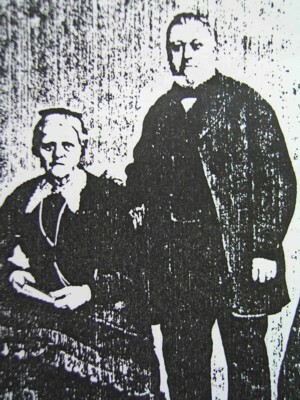 Above photo of Samuel Henry & Hannah Maria Platt c.1890. Descendants of Daniel & Mary Grigg. Mainly from Halesowen, Worcestershire (originally in Shropshire) then spread to West Bromwich, Staffordshire, UK. Descendants of Emmanuel & Mary (Culvit) Grigg. This line of Grigg's comes mainly from West Bromwich/Smethwick, Staffordshire, UK. Descendants of Henry & Maria Grigg. This line of Grigg's comes mainly from Oldbury, Worcestershire (originally in Shropshire), UK. Descendants of Thomas & Hannah (Smith) Grigg. This line of Grigg's comes mainly from Smethwick, Staffordshire, UK. Please note that these trees are very basic with little additional information. When time permits, I will add sources, occupations, etc. Most of this information comes from UK Census Records and various Church Parish Registers. Please e-mail me if you would like any additional information or have anything you would like to add. I would like to thank the following people who have helped & contributed to my research over the years. Your help has been greatly appreciated. Louise Platt, Robert Tomkinson, Lisa Derbyshire, Peter Birkett, Heather Owen, Don Grigg, Jackie Flowers, Val Hurst, David Hughes, Caroline Roberts, Paul Oliver, Keith Cherrington, Roger Grigg. There are many others who I have lost contact with over the years. Please feel free to email me & re-establish contact.